According to the sticker still on the box, I paid $6.00 for this kit at a local hobby shop that since went out of business. When the U.S. Army received the first Boeing XP-26 fighter in early 1932, it openened a new age in military fighter aircraft. Of all-metal structure and covering, the P-26 departed from the conventional designs of the twenties by adopting a semi-cantilever monoplane wing instead of the familiar biplane configuration. To reduce structural wieght the thin wing was externally braced since this small amount of drag more than ofset the weight penalty of the fully cantilever wing. Although retractable landing gear was beginning to make its appearance on high performance aircraft, the P-26 was fitted with fixed gear, again scrificing a small amount of drag for the weighty and complex retracting mechanism. The first flight of the XP-26 took place on March 20, 1932. At this time the prototype bore the designation XP-936. Flight testing of the little fighter proved its performance was as advanced as its appearance. Weighing a few pounds heavier and with only 20 hp more than the Boeing P-12F, the XP-26 flew 27 mph faster and could outclimb the biplane by 476 feet per minute. The new fighter was truly revolutionary and the Army place its larges order in thirteen years for 136 of the trim little ships. As the P-26 squadrons grew, two desitgn problems became apparent. During landing on soft ground the wheels of one P-26 dug in and the plane overturned. Though damage to the airplane was minor, the pilot was killed. To eliminate this hazard the headrest was reinforced and elevated eight inches. The second problem related to the high landing speed. The Army fitted flaps to one of their P-26's and found the landing speed reduced by 10 mph. At the same time, Boeing had encuntered the same problem with their export Model 281. The small, unimproved fields from which the plane was to fly made the hight landing speed quite dangerous. Split flaps of the same type developed by the Army were installed. These successfully reduced the landing speed and were retrofitted to all operational P-26's. Twelve export models were completed, one for Spain and eleven for China. One of the Chinese squadrons flew the P-26 continuously in combat against the Japanese scoring a high number of kills before the lack of spare parts grounded the planes. In the Philippines, P-26's took the brunt of the invading Japanese and some kills were scored against the superior enemy bombers. As the little fighter was phased out of U.S Army service, some of the planes went to Panama and Guatemala, the latter country using them as trainers as late as 1957. The popular name "Peashooter", though unofficial, has become the accepted nickname for this pioneering fighter. Wingspan 27 ft. 11 1/2 ins. Length: 23 ft. 10 ins. Max Speed: 234 mph at 6000 ft.
Armament: Two 30 cal machine guns or one 30 cal and one 50 cal machine gun. Two 100 lb bombs. Minicraft/Hasegawa is a model company based in Torrance, CA. The make all manner of model subjects in the popular scales. 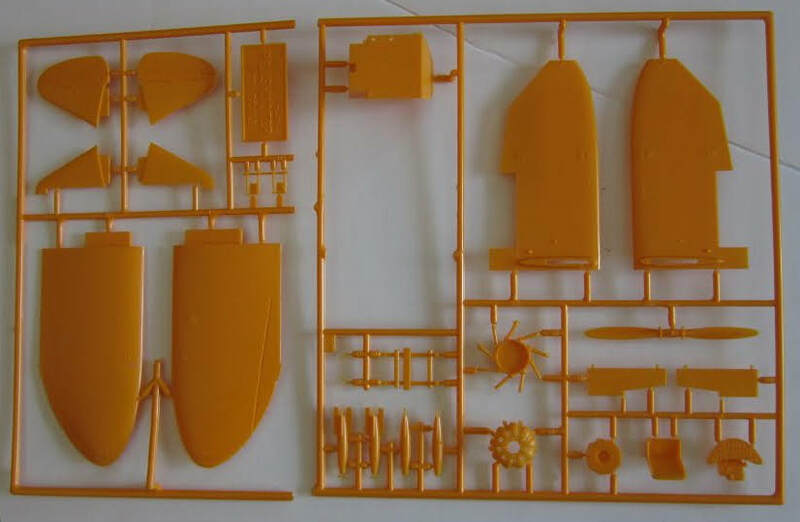 The box art shows a color photo of the model assembled and painted. Photo is enlarged to show detail. The body and landing gear legs are a dark blue. the wings, rudder and elevators are yellow. The cowling has stripes of yellow, red and black around it. There is a wide diagonal band around the fuselage with a logo of a blue circle with a what looks like a castle with a bomb burst above it over a scroll that says VISION OF VALOR. It has red and white stripes on the rudder flap. 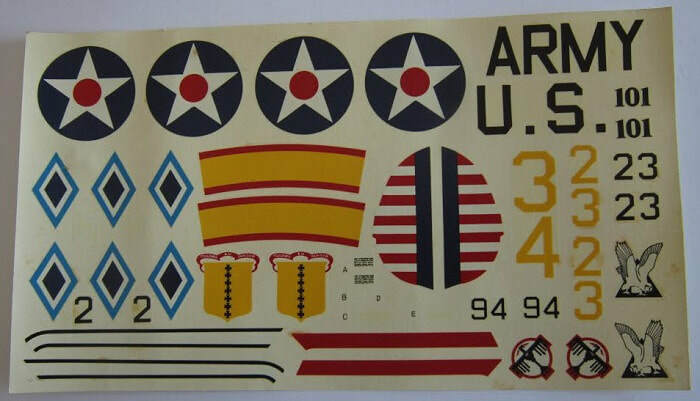 This marking is not included on the kit's decal sheet however. 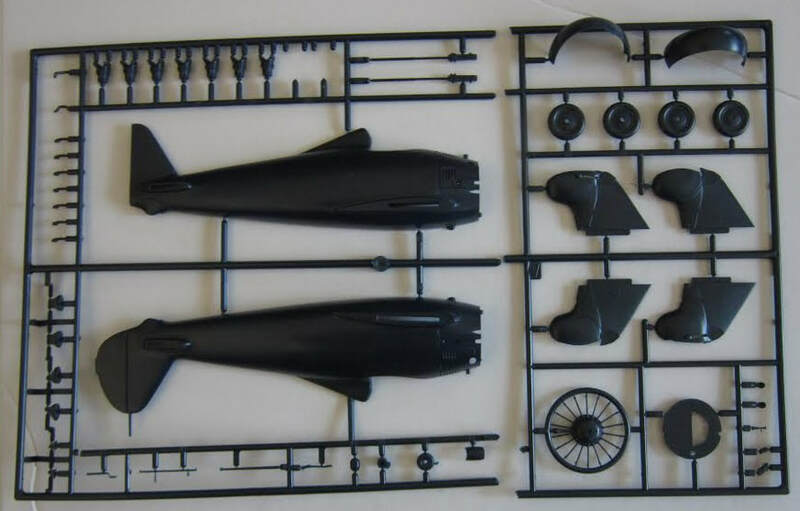 83 precision molded components, length 8.94", wingspan 10.48", molded in two colors plus clear, fully detailed cockpit interior, fully detailed Pratt & Whitney R-1340 engine, Scalemaster brand full color decal sheet. This is followed by a small color repeat of the box art and a one paragraph history of the P-26. The other side panel shows two more repeats of the box art. Followed by Manufactured in U.S.A. under license from Hasegawa Model Co., Yaizu, Japan. Minicraft Models Inc., Torrance, CA. MADE AND PRINTED IN THE USA and the address of their Canada office in Ontario. This kit contains two dark navy-blue trees and 2 yellow trees, the clear windshield, decal sheet and instructions. Trees are not cello bagged. The instructions consist of a single sheet that 17" x 24 1/2". It is folded twice to fit the box. One side of the sheet has a black and white photo of an actual P-26 in flight of the clouds. It is dark blue with yellow ings and elevators and red and white stripes on the rudder flap. It has a round logo on the sides of the fuselage with a row of stars around it and I think an eagle. However, it is difficult to make out if it is an eagle. This marking too is not one on the decal sheet. Behind this logo there are two diagonal fuselage bands. Below this is the history of the P-26 and Minicraft's stree address in Torrance, Ca. 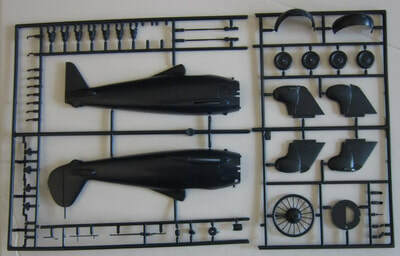 The parts trees illustrations are on this side also, with a listing of the manes of the parts, over a black and white photo of the model made up in yet another marking scheme that is not included on the decal sheet. 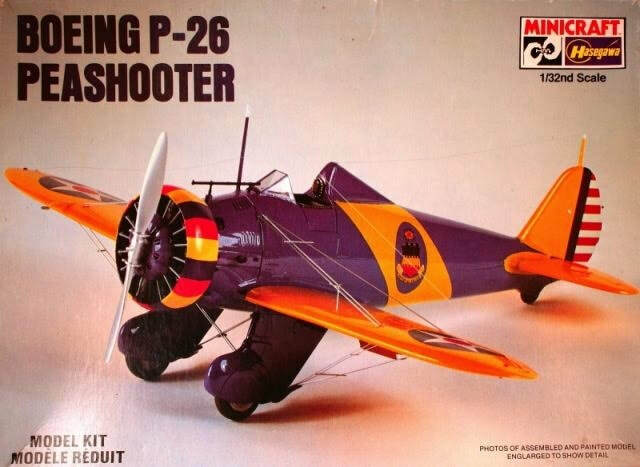 It shows a P-26 with a dark blue body and yellow wings and elevators. It has light colored chevrons on the landing gear fronts and a pionted stripe down the fuselage extensing from the cowling. Red and white stripes on the rudder flap, A logo on the sides of the fuselage that cannot be made out and the number 62 on the sides of the rudder.. The rest of this side of the sheet has assembly steps numbers 8 to 11 on it and a 3-view illustration of a P-26 showing the locations of the wire braceings. 1. A P-26 that is overall light blue fuselage, white and red fuselage stripe, red and white stripes on rudder flap, yellow rudder front -wing & elevators. A white circle with a black bird on it on the fuselage sides and a red 23 on the rudder. 2. A P-26 that is overall blue fuselage, yellow wings - rudder -elevators, yellow cowling with red stripe around it. Yellow fuselage band edged in red. black 101 on sides of rudder. red and white stripes on rudder flap. Logo of a yellow shield with a row of 7 black crosses down it and a red ribbon above it with white lettering TOULOURS AU DANGER on it. 3. A P-26 that is overall blue fuselage, grey wings and landing gear and underbody. It has a yellow 2 on the sides of the rudder and Philipine Air Force markings. 4. A P-26 that is overall dark olive-drab, with red and white stripes on the rudder flap. It has some yellow on the front of the rudder and a light colored diagonal fuselage strpe.with a black triangle with a white owl on it. Except for the Philipine scheme. Which was obvious to figure out. The other three schemes don't say what squadron they were with. Also, these schemes are printed in black and white and only a few things are called out as what the colors are. The rest are guesswork. ​2 crew figures shown in the parts trees illustrations as being on letter B tree have been removed at the factory. Strange!! 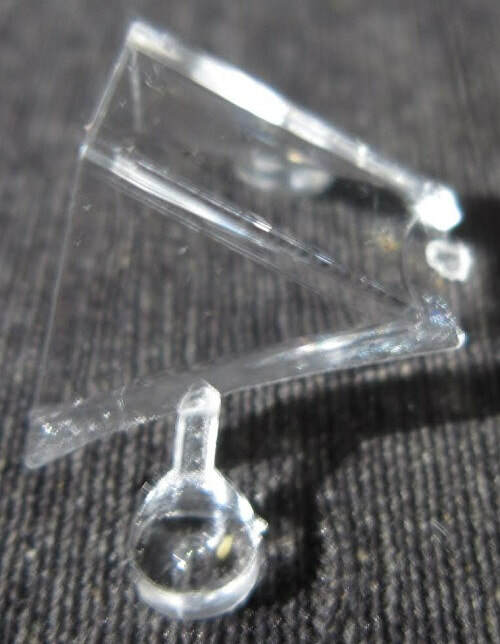 The single clear piece is the windshield part. This is generally an easy build. The only tedious chore will be doing the wire rigging on it.